Hi everyone, Lucy from True Colours here, joining you this evening with a post about using Fibralo pens with stencils for a change! 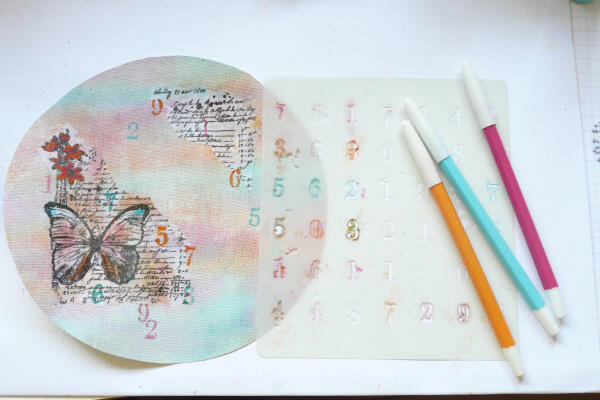 They work beautifully with the delicate new Hot Picks numbers stencil, and it's fun matching the pen colours up with the Frescos! I first used an embroidery hoop with a stamped design many years ago with vellum, but I thought today I would use a sheet of canvas, and emboss onto tissue paper to get a crisp image. I'm sure it would work great directly onto a finely woven material though. 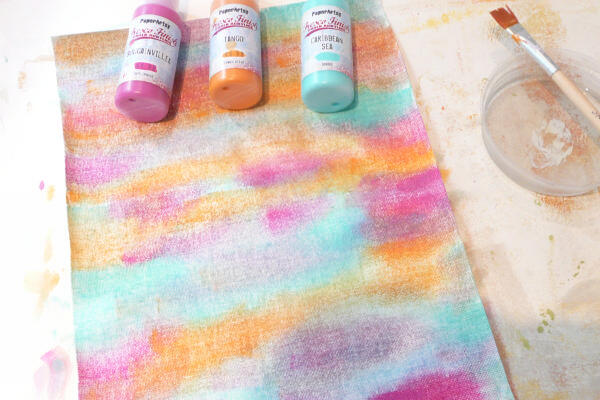 Step One: Paint a sheet of canvas with Frescos in Bougainvillea, Tango, and Caribbean Sea. Step Two: Knock back and blend the colours by dry brushing with Chalk Fresco. 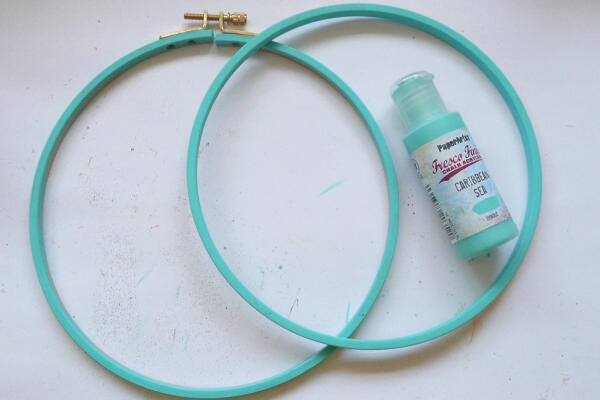 Step Three: Paint a 7 inch diameter wooden embroidery hoop with Fresco in Caribbean Sea. Draw around the outer ring onto your prepared canvas sheet and cut out the circle. 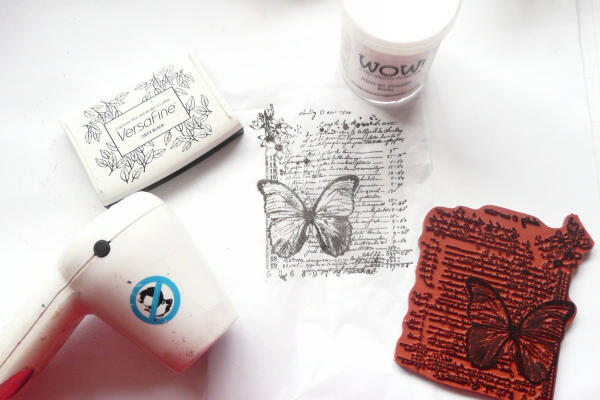 Step Four: Using Versafine Black Onyx, clear emboss the butterfly script stamp from HP1301 onto tissue paper. Tear the tissue diagonally so you have one piece with the butterfly and the little flowers, and a smaller piece with some script. 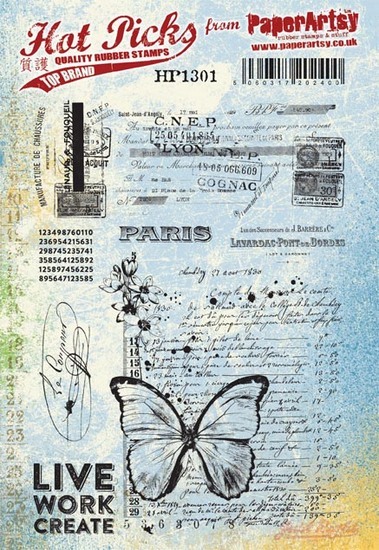 I have used the portion top right on the stamp. I didn't use the whole image. 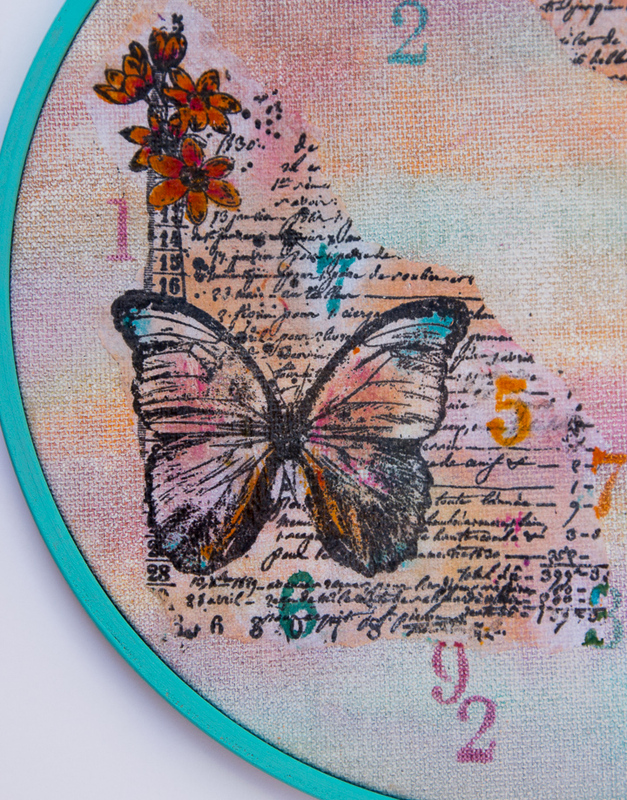 Step Five: Adhere these pieces to the canvas circle using Golden Matte Gel Medium and when it is dry, add some touches of colour to the flowers and butterfly with the Fibralo pens which best match your Fresco colours. 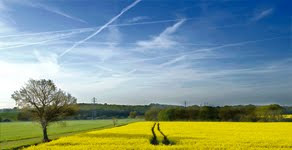 Simply dab the colours on and blend a little with your fingers. Love it! 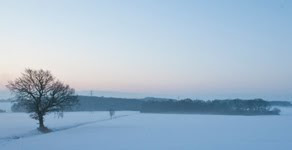 I found it also helped with blending any whiteness from the tissue. Use the same pens through the numbers stencil PS021 , partly over the plain canvas area, and partly over the script. Step Six: Finally, glue the canvas circle firmly inside your prepared frame. Here's a close up of the butterfly and flowers! I really enjoyed making this quick and simple project which I think would make a great home decor item hanging on a wall or as an inexpensive gift. 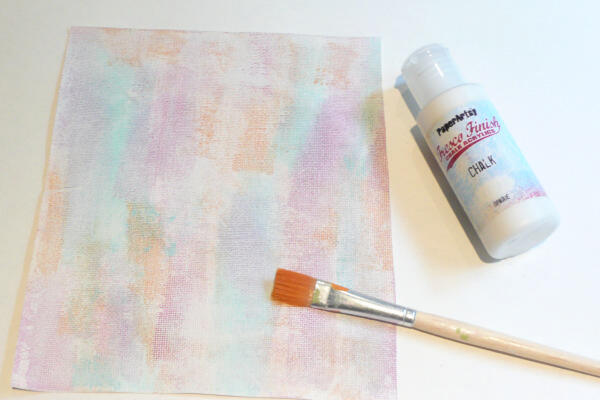 I'm looking forward to using the Fibralo pens with my other PaperArtsy stencils and I hope you will give it a go too! This is so pretty Lucy, lovely use of colour blending, and being able to coordinate the pens and the frame really ties it all together. I love this Lucy and you've inspired me to get all those hoops out that I have from my cross stitch days! This is so pretty & I love your colour shading. 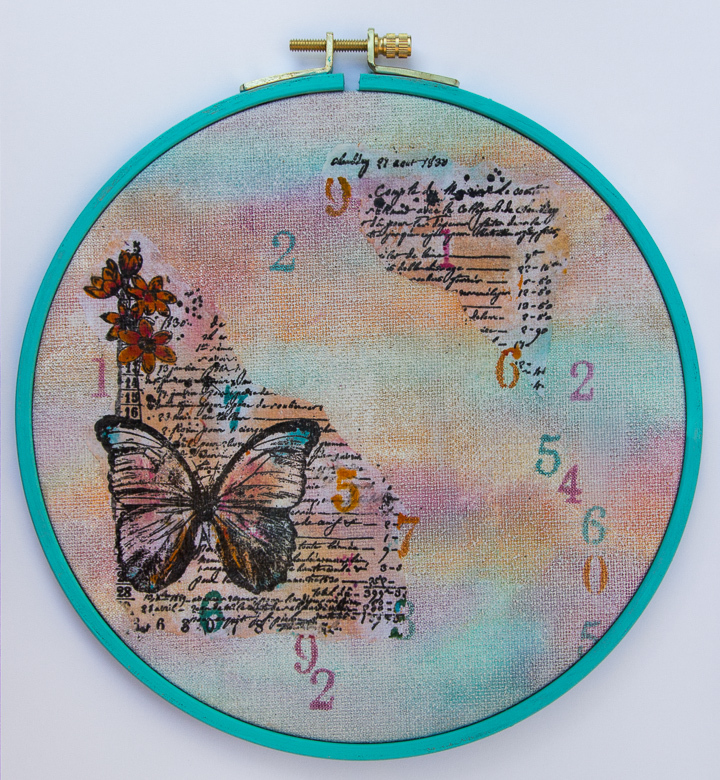 Absolutely lovely, Lucy - such pretty colours, perfect with the delicate image and stencil. Embroidery hoops... hmm! What a beautiful home decor project, Lucy. Love that you did it on canvas, it's such a great texture.